Okay, the recent Paradise International Music Festival at Aseana Open Grounds in Paranaque featuring Whiz Khalifa and Kanye West was a huge success. Spotted at the event are a number of huge Pinoy celebrities from entertainment and fashion industries. As expected, the festival also gave birth to some controversies, one of which is the unexpected sightings of James Reid and ex-girlfriend Ericka Villongco's sister Krissy. Netizens immediately reacted to the photo posted on Instagram by their common friend Debbie Then showing James in an intimate scenes with Ericka's sister while Nadine is also in the same venue. The of Magic 89.9 DJ and host has since became the subject of tirade online. 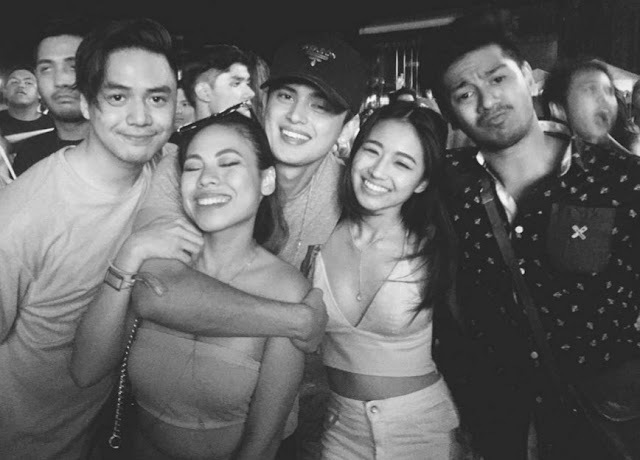 Earlier that night, JaDine fans were put on a high heaven upon learning that James was seen dating Nadine at the festival. Their excitement was immediately interrupted when another photo showing James, in a series of photos posted by fans online, enjoying the festival with Krissy. So where was Nadine when James and Ericka are partying?